Rediff.com » News » Navy's new submarine hunter ineffective? Navy's new submarine hunter ineffective? 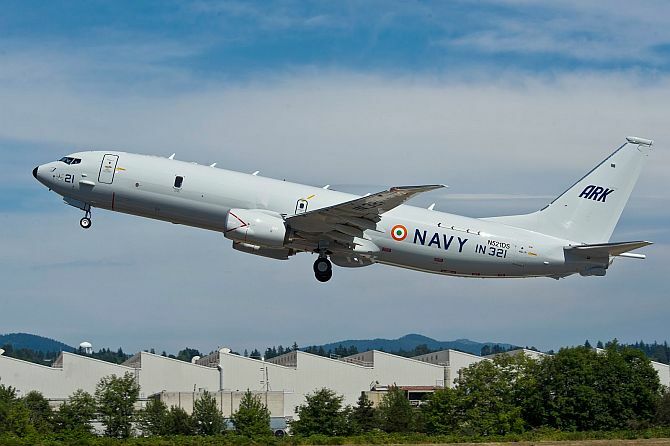 A yet-to-be-released US Department of Defence report has found that the Indian Navy’s expensive new Boeing P-8I multi-mission maritime aircraft ineffective at surveillance and detection and destruction of submarines. 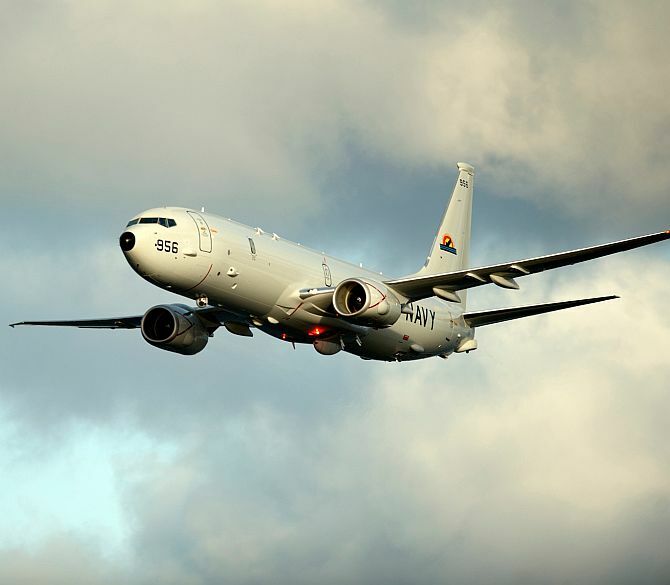 An unexpected and worrying question mark has been placed over the Indian Navy’s expensive new Boeing P-8I multi-mission maritime aircraft, which were bought to allow the navy to monitor the Indian Ocean and to destroy enemy submarines that it detected. According to a Bloomberg news report, the US Department of Defence (Pentagon) has found that the US Navy’s version of the aircraft, the P-8A, is ineffective at both surveillance, and in detecting and destroying submarines. Michael Gilmore, the Pentagon’s chief weapons inspector, has reported that the P-8A “is not effective for the intelligence, surveillance and reconnaissance mission and is not effective for wide area anti-submarine search”, according to Bloomberg, which cites Gilmore’s annual report on major weapons. The Indian Navy, which has bought eight P8-I aircraft for $2.1 billion, is Boeing’s first international customer for this platform. 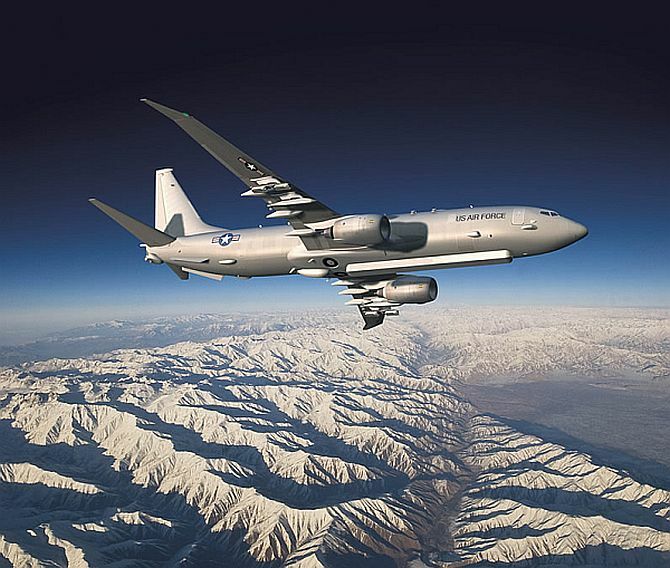 P-8I’s cutting-edge sensors, radios and submarine-killing weaponry are integrated onto a special Boeing 737 aircraft, giving it the endurance to fly 1,100 kilometres to a patrol area, remain “on station” for six hours, and then fly back to base. Yet the Pentagon’s report, which has not been officially released, points out flaws in the aircraft’s radar performance, sensor integration and data transfer. It says that current version of the P-8A had not overcome “major deficiencies” identified in combat testing in 2012-13. Contacted for a response, the Indian Navy and the MoD did not reply. The Boeing Company has declined to comment, stating that the Pentagon report had not been officially released. The US embassy in New Delhi did not respond to an emailed request for comments. For Washington, as for New Delhi, this news is worrying. The first P-8A of 117 that the US Navy plans to buy was deployed to Kadena, in Japan. It is operating along with others in the tense maritime environment of the Sea of Japan, tracking Chinese submarines. The three P-8Is already delivered to India (with five more due to come by 2015) are based at Arakonam, near Chennai, to watch over India’s 7,500-kilometre coastline and the ocean stretch from the Strait of Malacca to the Strait of Hormuz. Vice Admiral Robert Thomas, who commands the US 7th Fleet, backed the P-8A, stating on January 10 that it “represents a significant improvement” over the P-3 Orion, which it replaced in the US fleet. The P-8I’s sensors include Raytheon multi-mode radar to detect aircraft, ships and submarines, while another belly-mounted radar looks backwards, like an electronic rear-view-mirror. When a submarine is suspected, the aircraft drops sonobuoys into the water, which radio back suspicious sounds. A “magnetic anomaly detector” on the P-8I’s tail also detects submarines. 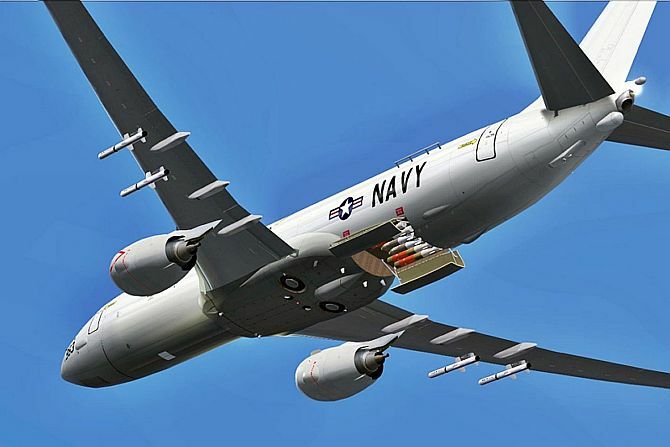 The P-8I can destroy ships and submarines with Harpoon missiles, Mark 82 depth charges and Mark 54 torpedoes mounted on the aircraft.